FilmFodder wrote a comic book review, How Not to Write a Comic Book. Most of it is helpful–I agree that having too many team meetings or random fights can drive the plot to a screeching halt, as if the writer is trying to burn up time while he figures out where the plot is headed. However, I’d like to offer a qualification for the following statement: “Here’s a hint to the writer and artist: if the writer has a person saying one thing, don’t show her doing the exact opposite.” Okay, it could be a problem if readers don’t understand why there would be a discrepancy. (I haven’t read the issue, but based on the review it sounds like there isn’t a good reason for the character to explain why she’s refusing to train as she is training). However, under some circumstances, having a character say one thing while doing another might be dramatically effective. The character is being hypocritical. For example, a character talking about the need for sacrifice at the same time he’s eating a lavish dinner. In most cases, a hypocritical character won’t be aware of the hypocrisy, but perhaps he does know and just doesn’t care what the other characters in the scene think of him. The character is lying from off-panel. For example, John might give Mark’s widow a sob story about the horrible “accident” that killed Mark, but as he says that the camera flashes back to John shooting Mark in the back. If readers don’t understand why there is a discrepancy between what a character says and what you’re showing the readers, readers will probably get confused. 1. I would recommend using your symbols in unexpected ways. For example, fire is most commonly used to symbolize destruction and/or Hell. However, there are so many more options that are creative and fresh. For example, fire represented ignorance (and possibly political correctness) in Fahrenheit 451 and civilization in the story of Prometheus. If the symbolic meaning you’re going for is the first one that comes to mind with that symbol, maybe you could be a bit more creative. 2. In a comic book script, make sure that you tell your artist how you want the symbol to appear. Otherwise, the artist may inadvertently mangle the meaning of the symbol. For example, if technology is supposed to be a sign of progress and civilization in your story, you’d probably want the cars to look shiny and new rather than grimy and decrepit. Unless you specify otherwise, it’s up to the artist’s judgment. After you’ve written the script for a comic book page, I would recommend doing a rough sketch of the page before you give the script to your artist for pencils. That will help you identify staging problems early. Here are a few examples. 1. Will the panels have enough space to comfortably fit the content? As a rule of thumb, I think it’s especially important to check this if if the page has 7+ low-action panels or 4+ action panels. (Low-action panels, like most dialogue, usually require less space because they don’t need to show as many things happening. For example, a dialogue panel might just have a person’s head, whereas an action shot of two boxers going at it will probably include at least the upper bodies of two men). 2. Will the panel’s perspective portray everything you want to show? For example, if two characters are facing each other, it can be quite tricky to show their expressions, particularly if you’re trying to focus on one. 90 degree side-shots get boring fast and have trouble emphasizing either subject. It’s hard to handle backstory (what has happened in the past of the story). Most authors just use dull exposition. “Twelve years ago, John McGruesome was a mob hitman…” Here are a few common problems with backstory. 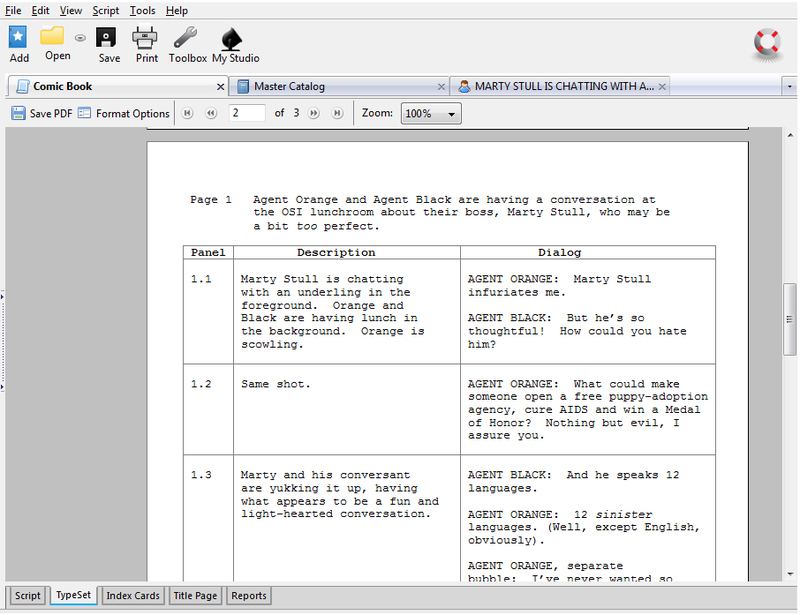 Celtx is a free scripting program that is designed for comic books (among other types of scripts). I find it very useful. 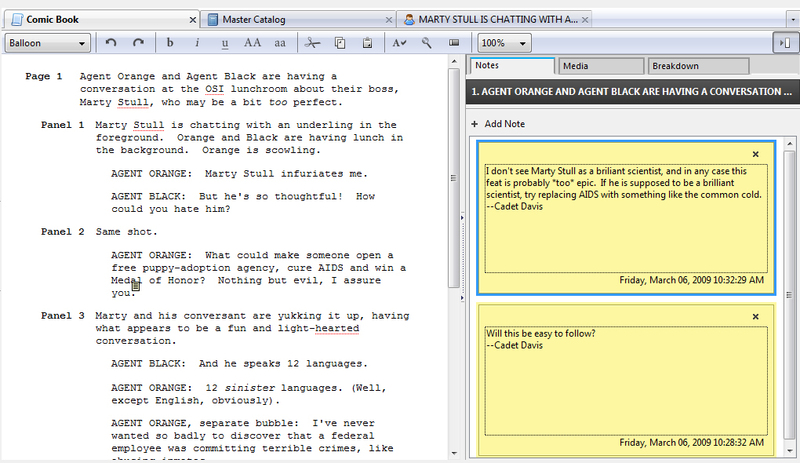 It produces scripts that are generally easier to read and navigate than Microsoft Word. Easy to learn. It took me 10 minutes to figure it out by trial and error. It’s extremely good at converting scripts into typeset. (You can see an example here). A typeset separates the in-panel text (like dialogue, captions and sound effects) from the text that won’t actually appear in the panel, like your directions to the artist. That’s useful because it helps you gauge how large the panels will have to be to accommodate the text. Handles comments notably better than Word. It’ll help you keep your comic book documents separate from your other files. If you like to fill out index cards with important details about characters or places, it can help keep those details accessible and organized. Built-in spellchecker. Not that important for a professional proofreader, but you might find it helpful. It’s not as easy to add dialogue as new pages or panels. They should add buttons for New Panel and New Page. It can’t save scripts as Word files. Everybody (like friends and editors) is comfortable with Word. Right now, if I have a Celtx script that I want to show you, I have to also tell you how to download Celtx and pray that you figure out the software quickly. One last note. I haven’t had a chance to test its printing capabilities yet. Given that Celtx can’t produce Word files (as far as I know), its ability to print usable scripts is essential. Generally, a book has only 5-20 pages (depending on audience age and genre) to establish three critical elements. The status quo of the main character. What is this character like before everything goes wrong? In the Lord of the Rings, for example, Frodo celebrates Bilbo’s birthday before being called upon to save the world. In Superhero Nation, Gary is a workaholic accountant. The inciting event. What throws the character off his status quo? Usually, this is the point at which everything starts to go wrong. For example, in Superhero Nation, Gary narrowly survives a car-bombing very early on. This forces several changes on him: first, he is transferred away from his job for his safety. So he’s completely out of his social comfort zone. Second, assassins are now trying to kill him. A goal for the main character. This is usually a response to the inciting event. This can be as simple as “I want everything to return to normal.” Gary wants to rebuild his life by getting a job somewhere and he wants to survive the assassins. This brings him to the superpowered Office of Special Investigations. Wacky hijinks ensue! (Buy the book when it finally gets published, heh heh). A lot of manuscripts get bogged down in details that are typically too far removed from these three goals. Prologues. They usually lack immediacy and, far too often, they just skip the main character entirely. Ick. The main character is almost always the best available way to hook readers into your story. Backstory. Typically, it doesn’t really matter what your character was doing 5 or 10 years ago. Readers want to know what’s happening now. If you are literally unable to start the story without explaining what happened 5 or 10 years ago, you may wish to reevaluate the starting point for your story. Ahem. “If your backstory is more interesting than your current era, you’re writing the wrong story.” If you have to introduce backstory, try to keep it to a bare minimum. Tell us only what we need to understand what is going on now. Side-characters. If the side-characters are the best hook to your story, there’s probably something wrong with the main character and/or the plot. For example, if a fantasy novel wants to show us the parents of the hero right before he is born, that will trap us in backstory. Furthermore, will readers care about the hero’s parents? Probably not. If they were the most interesting characters in this book, they would be the leads. Harry Potter #1 was very well-written, but it made a questionable choice to start the book when Harry was an infant. It was a very slow beginning. Elaborate settings. Typically, the main character is a better hook into the story than the world is. A strong character can be relatable and likable, mostly unlike a strong world. Try to limit the setting at the very beginning to just what we need to understand the main character and the plot. In a comic that probably ranges from 24-32 pages, you really need to get to the inciting event (probably the radioactive spider-bite or however else your hero got his powers) as soon as possible. In a superhero story, I’d recommend giving the hero his powers early enough in the first issue that you can introduce his goal. Ideally you can conclude the first issue with a fight or some other climactic event that gives you some room to offer some resolution (which satisfies readers) while setting up a greater conflict that will leave the readers wanting more.